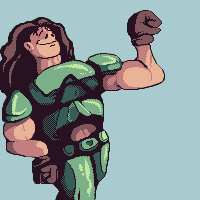 firstly you should note that doomguy doesn't have long hair..
Nearly finished version: any final suggestions before I upload it? The dithering should probably be replaced if you have any extra colors. 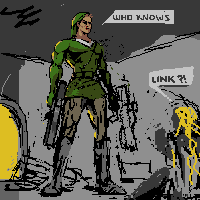 That version only uses 8 colors, so I could remove the dithering. Not sure if the extra colors would benefit it in anyway though.. It would benefit from not needing dither. He always wanted save a princess. I love the concept, a3um. But is there anything you can do to make it more evident that it's Doomsguy? 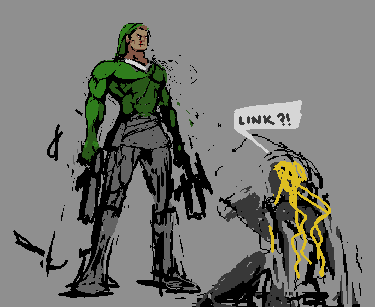 If you didn't know about the challenge, you'd just think this was Link with a couple of guns. @DatMuffinMan: Really looking forward to seeing that pic with a mullet. Which means you're going to shorten the hair in the front, right? @a3um - the composition looks great, but the text is hard to read, since the Zelda's dialogue is under "Link's," even though it is said before (I think it is, anyway). Looks like he has an arthritis in his right hand. I also don't really understand what he is doing. Maybe it would be better to have that hand facing towards him than away from him if he is flexing? I assumed Muxaun was referring to the actual right hand, not our right hand..
Just google "mullet" and you'll get a better idea of what we're talking about. Ultimately, you decide the style you're going for, so if you prefer the long hair, go for that. He just suggested a mullet because it's very corny 1980's and 1990's hairstyle, which fits a corny 1990's computer game about killing daemons with chainsaws and brass knuckles. I see exactly what you're referring to for the elbow, but I was trying to make the arm squeezed more as if he was flexing really hard, I'll google some refs to make it better. Also, thanks for the help on the right hand, I'll try and fix that one too. Can anyone see where I'm going with this? This piece is in the queue but I don't know if it follows the rules of the challenge so its sitting there and would hate to overlook it and have it miss the deadline. imo none of WIPs posted here follows the theme really well. Except for CELS' of course. I don't see a reason why doomsguy cannot stay with his friends during his day off. But this piece certainly needs a bit of explanation how it fits the theme. When Doomguy isn't fighting demons...he's clearly running for president of the U.S.A., of course! Any C+C is more than welcome, I'm still working on it. when doomguy isn't fighting demons He goes to the mall in his deluxe car. I don't see the finished version that was in the queue any more, but I was a bit confused about how it fits the challenge as well. EDIT: Found it in the gallery. Yeah, I would say it doesn't fit the challenge, unfortunately. By the way, Pixelart_kid, I really don't see what's going on with the chin of the marine with the long black hair. Does he have multiple chin, or is that supposed to be stubble or some kind of beard? It's kind of hard to see. If it's stubble or a short beard, I think a solid field of colour would be more effective. Like Homer Simpson's stubble. Hey everyone! I am phraktol, new to the site, and new to pixel art in general. I've been an admirer of much of the art on this site, and finally got the stones up to give myself the challenge of producing Pixel art. I figured trying the weekly challenges might be a good way to learn a bit, and get some input. I'd love your input, and i will update as I keep going.. hopefully I'll have something a bit more awesome before time runs out haha, but either way I will be participating in future challenges, as I feel this is a great learning experience. Edit: I think this will be my final version for this challenge :P Not too horrible for my first attempt at something like this, I think lol. Nice job! Here's a few things you may want to look at. - Try to experiment a bit more with different colours. Skim through this thread for a quick introduction on palettes. - Decide what perspective this is. 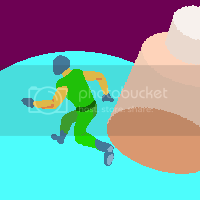 If we're looking straight at Doomguy, horizontally, then we shouldn't be able to look down into the bowl. If we're looking at him from above, then the perspective on his upper body is wrong, because we're seeing his upper body from the front. Right now, it looks like he's leaning back on the toilet as if it were a lounge chair, which is impossible on most toilets. - Right now, the two halves of his body are completely symmetrical in every way, and it's unclear where the light is coming from, because the light seems to hit him from several directions equally. Try to make it more clear where the light is coming from. - At a glance, his abs can easily be mistaken for fingers. So it looks like he's drumming his fingertips together like Mr. Burns, hatching a plan on the toiler. all very good points, and thanks for the feedback. I'm really new to this, and have been reading a lot of tutorials, and color pallets are something I definitely need to work on. I'm constantly amazed by the art I see on this site, and it's been very inspirational, and I will continue to get better. I've been a little busy lately, I'm trying to reduce the color palette. 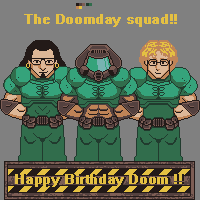 About the another topic, Doomguy celebrates his birthday with his mates, which are similar to some game designers. I hope I have not inconvenienced. I will edit the image. I recently did an update of the colors in the image, so no problem. 24 hours left. Any feedback is welcome at this point. I do realize there's still a lot left to do. I will do some foreshortening on Doomguy. please, take a look at this tutorialposted here on pixeljoint, a whole lecture on it, and then analyze your image. you are not doing this right and again, you're lying about your palettes and color choices. please, do not waste your and our time with this. there is a lot of work to do on your piece from both proper color choices, to proper anatomy, to proper shading and even the theme makes no sense to what the challenge is asking you to do. Well, I don't think he's wasting anybody's time with his submission. Couldn't it be that he just did his best and that's it? Worst case scenario - he'll get less votes. Pointing to a tutorial which pretty much everyone new to this site already saw and repeatedly saying he's not following the challenge's theme is not the most constructive feedback. Also, pj:specs says he's using 16 colors which is the maximum allowed in this week's challenge. That looks interesting, I hope you're finish. I am very sorry if you wast time, but I'm not lying, I used 16 colors. If I previously used 20 without realizing it, as I use the white in the eyes or body glitter, for example,It was human error (and it took me because I've been busy. I appreciate the feedback from the community PJ, I can correct it. 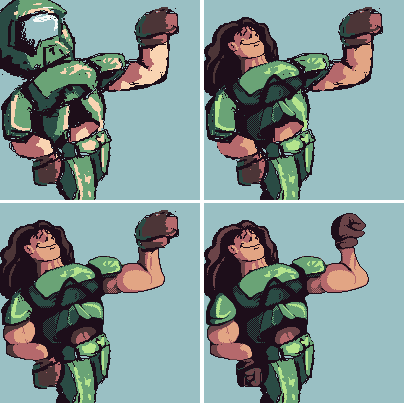 About the colors you use in your example(I appreciate for your time),this are cold colors, while I was trying to do a little more warm colors, especially Doomguy armor(as in my reference images). Doom guy celebrating his birthday together two of his friends(friends of Doomguy, I was inspired by two well-known character). The words above, is a reference to a line from an arcade game.